Instructions: Cut card base 5.5 x 5.5 inches in white card stock. Cut out the frame with the Intricate Swirls Die in white, cut it apart and adhere along sides of card base. Cut a blue plaid square piece of designer paper from the Cherry Blossom Retreat Paper Collection the size of the card base, distress and adhere. Cut out the Botanic Window in white cardstock, stamp the sentiment from the Words of Encouragement Cling Stamp Set in Jet Black on designer paper from the paper pad, adhere the window with foam tape for dimension and adhere all to the right side of the card. Stamp the birdhouse from the Cherry Blossom Retreat Cling Stamp Set, the birds from the Tweet Cherry Blossoms Cling Stamp Set, the bench and flower pot from the Wishing Well Oasis Cling Stamp Set, the flowers and rocks from the Woodsy Wonderland Cling Stamp set in Jet Black on media paper and color the birdhouse, bench, flower pot, and rocks with Zig Markers. Sponge the birds, wildflowers with ink. Cut out with corresponding dies. 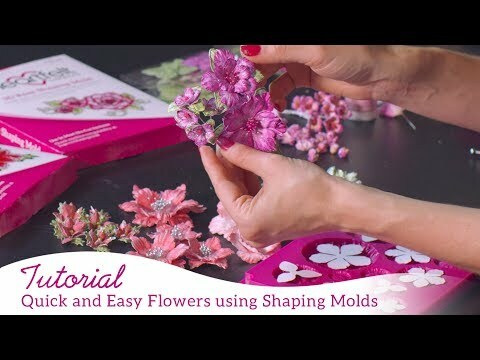 Stamp the flowers from the Tweet Cherry Blossoms Cling Stamp Set in Lulu Lavender, sponge with same and cut out with corresponding dies and sculpt with the 3D Cherry Blossom Shaping Mold. Add stamens to the centers of the flowers. Sponge blossoms with adhesive and cover with Crystal Clear. Stamp and sponge leaves from the Tweet Cherry Blossoms Cling Stamp Set in Bamboo Leaves, cut out with corresponding dies and sculpt with the 3D Cherry Blossom Shaping Mold. Adhere birdhouse, bench and scenery with foam tape for dimension and the flowers around the window and in pot, as shown.